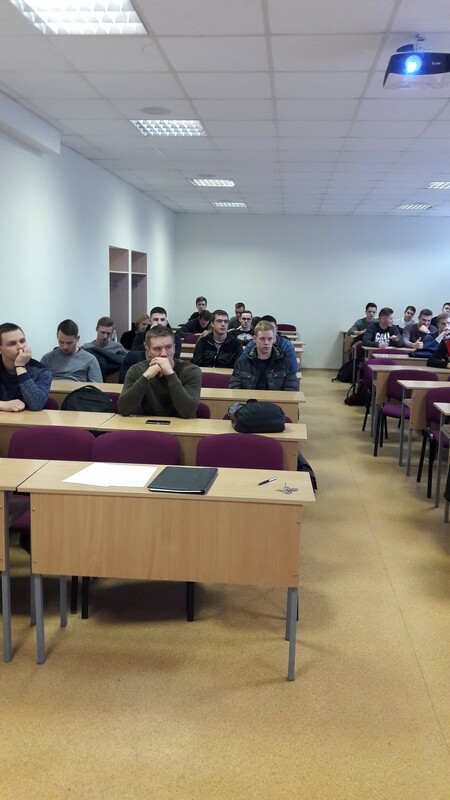 Like every year, so from this year (29 November) a lecture on the transport service platform “TimoCom” was read at Transprt Engineering Faculty Logistics and Transport Management Department. The lecture was delivered by a “TimoCom” representative Denis Pašala from Germany. During the lecture, the practical and theoretical methods of operation of this transport platform product were presented. An electronic map and tracking options were provided, familiarized with the European Freight Forwarding Program, a catalog of European transport companies, a barometer of cargo and transport and other products. Students had to answer practical questions related to specific transport and logistics problems. Long-term cooperation has given the first fruits. Practical arrangements, agreed terms and procedures were harmonized. And already in the summer one IV year student has conducted an international 3 month internship in Poland at “TimoCom”. About it was written in the press (the article was translated into 14 languages). The other article should soon appear in Belarus. The student was provided with excellent conditions not only to get to know the job, but also to organize a trip to Germany (central “TimoCom” headquarters).